Welcome to Tronster.net: Places to go, Places to eat. Places to go, Places to eat. Where has Tronster been for the last couple of weeks. I like to try and update the blog about once or week or so, but work has been tough, and we have been traveling again. Once my dad told me "Young people go see stuff, and old people go eat stuff." They live in a small town, and the culinary selections for my parents are limited. A couple of weeks ago, Sunshine and I loaded up and headed to east Tennessee. This past Memorial Day weekend as a matter fact. We first joined some friends at the Philippine American Association of East Tennessee. There we have some great fellowship and some great food. Because we traveled 8 hours to get there, some of our friends saved us a little bit of the food. 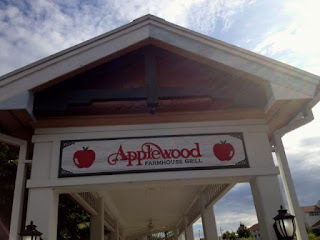 But this post is about the Applewood Farmhouse Grill, in Pigeon Forge. Its not on the main road, but just a block off. The grill front yard is full of apple trees. There are a couple of shops around that I would liked to have checked out, but we had to get to Dollywood. As we arrived around 10 am, the Applewood Farmhouse Grill was pretty busy, a table for 3 was about a 30 min wait. When we were seating in one of the 3 dinning rooms, we were greeted by a friendly staff. They bring out apple fritters and muffins with apple butter. Sunshine orders a nice breakfast combo, with a side of suger ham. It was the size of a platter. Needless to say, we had a half a platter of ham for sandwiches. I had the pecan pancakes. They were awesome. The were thick and fluffy. Overall the Applewood is a place to stop by for a real big breakfast on your way to Pigeon Forge or Dollywood.